Located in the Trikuta Mountains in the picturesque state of Jammu and Kashmir is a sacred Hindu temple known as Vaishno Devi. This temple is devoted to the Hindu Goddess Mahalaksmi and, is popularly known as “Mata Rani, Trikuta, and Vaishnavi”. Such is the religious significance of this pilgrimage site that the Reserve Bank of India (RBI) released special coins that included “Vaishno Devi’s” image on the coin in honour of this temple. Important travel information about this holy site is as follows. Although this temple can be visited throughout the year the ideal time to visit is in between October and March as the climate during this period is cool and pleasant with, the temperature ranging from a maximum of 14 degrees Celsius to a minimum of 10 degrees Celsius. b. How to reach Vaishno Devi ? The nearest railway station is located at Udhampur. The Udhampur Railway Station is well connected to most of the major cities in the country. If you intend to travel to Vaishno Devi then then starting points located in close proximity are Srinagar and Pathankot. a. How to reach Vaishno Devi from Srinagar : The shortest route to reach Vaishno Devi from Srinagar is via NH 44 as depicted in the map above. Alternatively, click on the Google Maps link here to view on Google Maps. b. How to reach Vaishno Devi from Pathankot : The fastest route from Pathankot to Vaishno Devi is via NH 44 and the route map is depicted above. Alternatively, click on the Google Maps link here to view on Google Maps. The closest airport to the temple (located at a distance of about 50 km) is in Jammu. The Jammu airport is well connected to most of the major cities in India. Taxi services to the town Katra are also available from the airport. According a popular folklore, the Vaishno Devi Temple located in a cave was first discovered by a Pandit called Sridhar about 700 years ago. This Pandit apparently was devotee of Goddess Mahalakshmi. It is said that it was Goddess Mahalakshmi i.e. 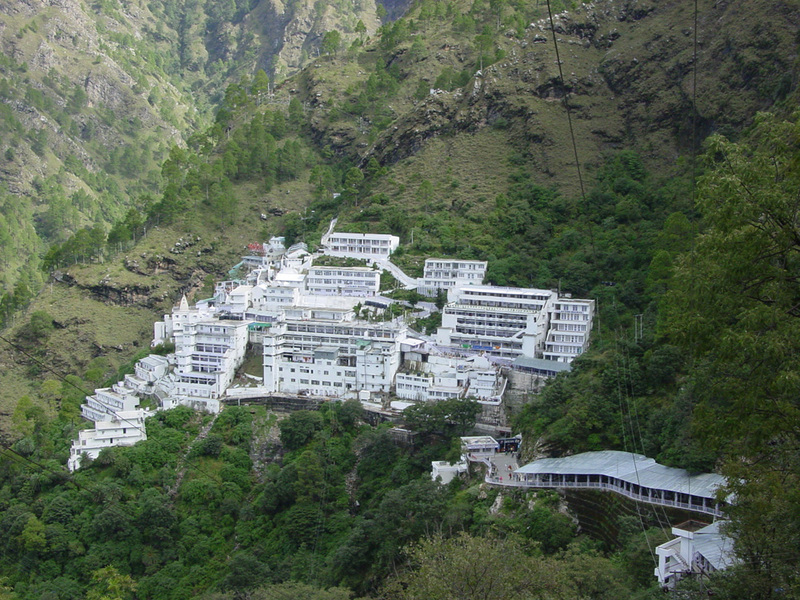 Mata Vaishno Devi that appeared in Sridhar’s dream and showed him the way to her temple in the caves. And so it was Sridhar who then initially help publicize this beautiful temple. Click on the link here to check out the places to stay near Vaishno Devi, Jammu and Kashmir on Google Maps.